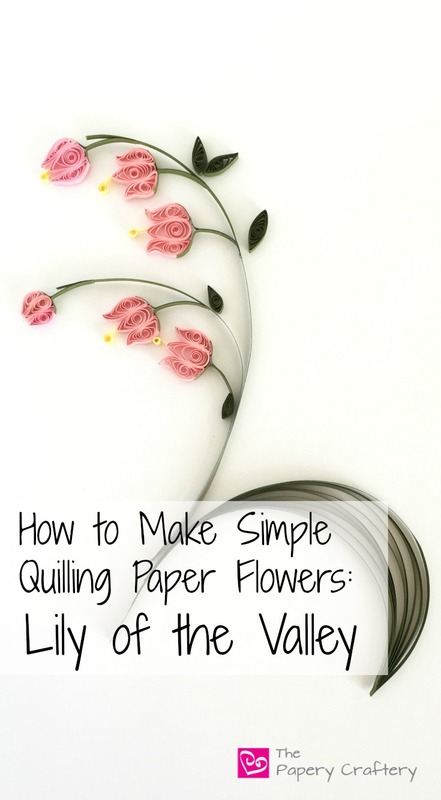 I’ve been having a lot of fun coming up with new tutorials for my “How to Make Simple Quilling Paper Flowers” series, even though this type of quilling is pretty far out of my wheel house. It has been pretty interesting researching flowers and plants, while trying to recreate them out of quilling paper. And it’s really sparked my spring fever! But this time, instead of showing a couple different types of flowers, I’m focusing on only one, the lily of the valley, which is still fairly simple, but has a few steps and techniques. The supplies that I am using for this how-to are 1/8″ width quilling paper in pale pink for the flowers and leaf green for the stems and leaves. Lilies of the valley are typically white, but I say, hey, be creative! I also used some white glue, my needle tool, straight pins and a waxed-paper covered cork board. The first step is to make the flowers. Each stem usually has quite a few buds growing off of it, but I chose to only quill 3 flowers per stem. The flowers are all formed by 3 6″ strips of quilling paper. Roll all into open coils and glue the ends to hold. Most of the buds quilled are going to be the fully opened lilies. Pinch one of the coils into a teardrop, and the other two bend into shaped marquise. The teardrop will be the center of the bud, with the marquise on either side. Once glued together and dried, they 3 coils will form the bell-like shape of the lily of the valley. I also chose to include a couple partially bloomed flowers at the tips of my plants. I made these with the same length of paper, but instead of forming shaped marquise, I pinched two coils into half-moons and attached them to the center teardrop coil. Another one of the distinguishing features of lilies of the valley are the large, broad leaves that grow among the delicate flowers. To start each leaf, measure between 8-10 6″ strips of dark green quilling paper. Stack them, one on top of the next, but in a progressive way, so that each end is a little higher than the one underneath it. Apply a very small amount of glue between each layer and push together so form a peak when dry. Next, run your quilling tool down the length of each strip to aid in the curve of the leaf. Then, holding the whole lot sideways, pull and push each strip individually until the leaf looks just the way you want it. When you’re happy with the look of your leaf, rip some of the remaining length off the strips at the bottom of the leaf. In order to have a more finished look that will blend easily with other stems and leaves, it is a good idea to end the leaf in a long, thin point. To do that, tear the tail ends of the quilling paper so that one of the outside strips is the longest and they gradually get slightly shorter towards the other side. Apply a small amount of glue between each layer and pinch into a point as it dries. Each leaf is a little different, but that’s what will make your flowers and plants unique! Lilies of the valley have small leaves too. Now for the short stems that connects the lilies of the valley to the main shoot. For each, use between 3-4″ of green paper. Fold each in half and glue the halves together, leaving only a small amount of the ends unglued. Secure the open ends of the green to the bottom of each flower so it seems to grow out of the stem. Also, tear some length off the end of the strip that will be attached to the main stem. Quilling paper always blends better when it’s ripped instead of cut! For a little extra pop, add some stamen to your flowers! I chose to use a pale yellow for these buds to add a little brightness. Simply roll a small tight coil on a very short strip of quilling paper and glue to the tail before releasing. When dry, trim the tail of paper to about 1/8 of an inch or so. They will be pretty tiny, but that’s perfect for flowers of this size. Now its time to put it all together! For the stems, I just used single strips of quilling paper with a slight bend. Then, I just played around with the placement of the flower buds and leaves until I was happy with the result! I think these lilies of the valley would work perfectly in bringing some height to a mixed quilling flower bouquet! Be sure to check out the other posts in this simple flower tutorial series, all about daffodils and flower buds, and plumeria and lilacs for some inspiration. And most of all, have fun and happy quilling! Hi there! Thanks so much for the question. Quilling paper definitely has a mind of its own sometimes. There are circle guides that you can purchase for a few dollars on quilling supply sites that allow you to place your coils down on certain sized circles as they are opening. Once they’re at the size you like, then you can glue. But, if you’re making lots of flowers, consider that nature isn’t always perfectly uniform! Let me know if you have any other questions, anytime! Meredith, would you like to send a picture of a job I did, based on their wonderful work. Thank you for sharing. How and where can I post my card? I’m sure everyone would love to see your work! If you’re on Facebook or Instagram, maybe you could post a photo there! Well put, Paris! Thank you!